The Loome philosophy is simple: we supply the highest quality furnishing fabrics, with excellent service, at reasonable prices. Our products and prices reflect this ethic; why not order some free samples and feel the quality of our cloth for yourself? We also offer free worldwide delivery when you order 15 metres or more, and very reasonable delivery rates for orders up to 14 metres. At Loome we specialise in period fabrics - but we also have beautiful modern designs as well. All our elegant upholstery and curtain fabric is available with a flame retardant finish and, of course, meets all UK and international standards. Welcome to Loome Fabrics. At Loome we specialise in period fabrics including medieval fabric, Georgian fabric, Victorian fabric, Arts and Crafts fabric, Art Nouveau fabric, Art Deco fabric and Mid-century fabric. Choosing upholstery material, for upholstering or re-upholstering a sofa or chair, can be time consuming and difficult. At Loome we aim to make the process easier by providing an easy to use filter system so that selecting the correct material is a pleasure, not a chore. By clicking on our fabric selector you are able to choose upholstery material by colour, type, use, and style. You can also specify characteristics such as washable and flame retardant. Upholstery unlike soft furnishings, is with you for a long time. Its clearly important to choose designs and colours that you will feel comfortable with for several years. When choosing the colour or colours to match or fit in with your existing decor, one should keep an eye to the future and think about any change of styles that you may wish to make. Dark or mid colours are generally more practical if you have furniture which gets a lot of wear, although pet hairs can show up against very dark colours. Soft or muted colours are very popular - not only are they very fashionable but also the are very versatile when it comes to combining with other colours to make an overall colour scheme. Bold colours look splendid and can make an otherwise unassuming item the central focus of the room. If a bold look is required without bold colours then choosing a neutral cloth for the upholstery but combining this with vibrant or contrasting accent colours on cushions or footstools can be effective. Plains, spots, stripes, floral, checks, patterned? This is another important question. Plain material is easy on the eye, and does not ask any searching questions of the observer. Patterns of any description make slightly more of a statement but this is, of course, often quite intentionally what is strived for. Against plain walls and curtains a plaid or striped sofa can look quite stunning. Another element for consideration is that the colour combinations woven into patterned, striped or plaid upholstery fabric provide more opportunities to 'tie in' other aspects of the decor with the colours of the fabric. So, for example, a plaid will often have 5-10 colours and any one of these can be picked up in curtains, cushions or other furnishings. Click here, as follows, to see Plain, Patterned, Floral, Striped, andTartan and Plaid Upholstery Fabric online. What Type of Upholstery Fabric is best for my Furniture? There is no single answer to this question. The most robust fabrics are velvets, chenilles, wools and heavy flat weave fabrics, whilst damasks and light weight linens, cottons and open textured flat-weaves tend to be less durable. However durability is just one aspect of what is best for you, in your particular situation. The answer must really depend on the type of cloth that you like and the look that you are trying to create. The best way to test different types of fabric is to order samples and lay them out on the furniture that you intend to cover alongside any other features of your room that you intend to keep or incorporate and to consider their appearance in different lights. 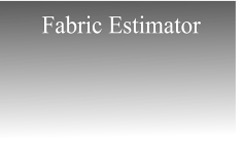 When ordering upholstery fabric online, the question arises: how much upholsteryfabric will I need? The answer to this question depends principally on the area of the piece of furniture that is to be covered. This you can measure and add up (e.g. back area, plus cushion area, plus arms, plus body) or refer to our sofa fabric estimator guide which gives an indication of the normal number of metres for more common sofa designs. If you are still unsure then why not send us a photo along with some measurements and we will give you a more accurate idea of what we think you will need. Choose unlimited curtain and sofa fabric samples. Each sample, which measures 11cm x 16 cm, is free but we charge a small amount for postage and packing - currently £1.75 per four samples ordered. You can order as many samples as you wish. All Loome sofa fabrics are flame retardant to British Standards. We also have pet friendly, child friendly and fully washable cloth. Whether you want to find the best upholstery material for a family sofa, the best sofa fabric for your pet to relax on, or simply want the browse through our many beautiful designs, please come in and spend some time in our online shop. At Loome we have around 400 different upholstery fabrics to choose from, including velvets, chenilles, linens, wools and damasks. Our website product pages show alternative colour ways for every one of our upholstery fabrics, as well as complementary products which will sit well alongside the main fabric chosen. At Loome we have one of the best collections of high quality curtain fabric online including tartan, check and striped curtain fabric. Our curtain materials include wool, linen, cotton, damask and velvet. At Loome buying curtain fabric online is very simple. Use our fabric filter tool and click the box marked "curtains". You will then see all the curtain fabrics that we offer. You can further filter your choices using colour, style and other categories until you find the ideal cloth. At Loome we don't just stock domestic fabrics. We also have an excellent range of high durability contract upholstery fabric, flame retardant to Crib 5 rating, ideal for all contract environments such as hotels, bars and restaurants. We also stock caravan upholstery fabric and marine and boat fabrics.